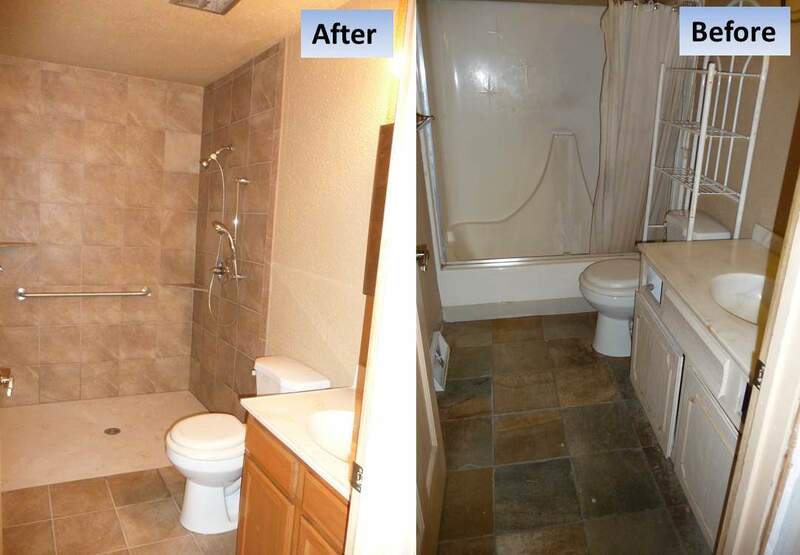 In this Curbless Handicap Shower, the bathroom and bath tub were very small and our client needed room to roll a wheelchair into the bathroom, past the sink and toilet to the shower. In a Curbless Shower, the shower needs to be the lowest spot in the bathroom. In this way the water cannot escape outside the shower. Also, because the curbless, or roll in shower, is flush with the floor of the rest of the bathroom, the shower base can be larger and closer to the toilet. Normally, a shower base cannot be closer than 8 inches to the toilet, but a curbless shower, or roll in shower can be within 4 inches of the toilet. The existing tub was 30 inches wide, but the walls of the tub took 6 inches on the front wall and 2 inches of the back wall, so there were only 22 inches of space inside the tub. This roll in shower base is 36 inches wide, which provides 14 more inches of space. Because of this space and the fact that a wheelchair can turn around on the tile bathroom floor and the shower, make this bathroom much larger and accessible for a handicap shower. We love the additional space in our bathroom and the curbless shower means I can take my wheelchair into the shower anytime I want!